Why don’t I make stir fry more often? It’s such an easy meal to throw together, and you can change it up every time. I was scrambling to figure out dinner for Larry and I the other night at um…let’s say 5ish, the kids were having pasta and I just wasn’t in the mood for pasta. I had an oversupply of broccoli in the fridge (thanks to Publix’s $1 bags of florets this week!) so I knew broccoli had to be a main ingredient. Looking in the freezer for ideas I saw shrimp. 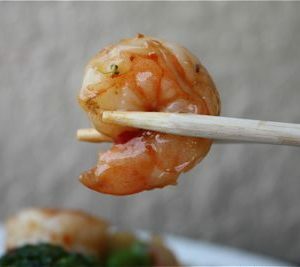 Frozen shrimp are so great to have on hand because they are so quick to defrost and cook. So stir fry it was. 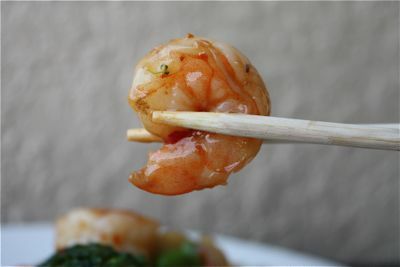 I like to cook up the shrimp in the wok first with some garlic, ginger and a couple teaspoons of oil. Once its cooked I set it aside and then add the veggies to the hot pan. 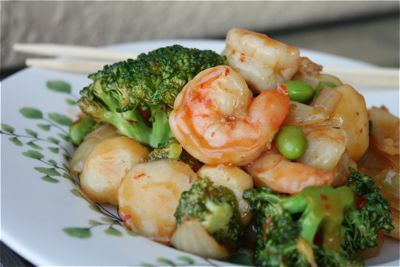 For this stir fry I used sliced onion, broccoli florets, water chestnuts and edamame. The combination was perfect. I put together a basic Asian sauce out of some staples and dinner was served. 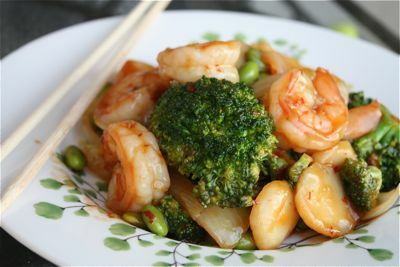 In a small bowl, combine rice vinegar, soy sauce, cornstarch, sesame oil, chile garlic sauce and fish sauce. Heat wok over medium high heat. Add oil, garlic, ginger and shrimp and cook until shrimp are just pink, about 2-3 minutes. Set shrimp aside.